If you are buying a home, no doubt you have been saving for the down payment for a while. You will probably be paying between 3% or 20% of the purchase price up front. But that's not all the money you'll be spending at closing. There are closing costs for both the buyer and the seller, with these costs covering all the expenses associated with the transaction. It's a good idea to get a handle on what these expenses might be and factor them into your home purchase. Real estate marketplace Trulia breaks down closing costs into two categories -- recurring and non-recurring costs. One way to think of recurring costs is as a pre-payment, not necessarily an extra cost associated with the purchase of your home. Because the mortgage lender wants to be sure that critical recurring costs are paid, it collects some of them upfront at closing and deposits them into an escrow account. Typically, the lender will collect money to pay a full year's premium for homeowner's insurance, plus another three or four months worth of payments. This is a cost you would pay anyway, you're just paying it in advance. The same is true for property taxes. The lender will collect enough money to pre-pay several months of taxes on the home. Then, when you begin making mortgage payments, a portion of the payment each month goes into the escrow account to keep both insurance and taxes up to date. As a homeowner, you don't have to worry about paying separate insurance and tax bills, which is a convenience. But you have to be able to pre-pay some of these expenses at settlement. Non-recurring costs include services performed by various third parties, as well as any fees the lender might charge. There are attorney's fees, filing fees, title search and title insurance, and fees for any other services that might be required for closing, such as an appraisal or a property survey. A buyer's closing costs can vary, depending on the property and the jurisdiction where it is located. According to Trulia, costs can roughly range from 2% to 5% of the purchase price, which is a fairly wide range. 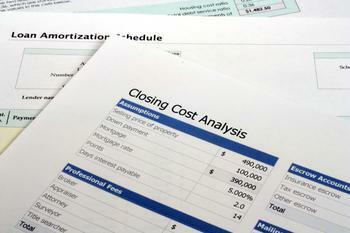 To help narrow it down a little more, Bank of America offers this closing cost calculator. While many homebuyers choose to pay the closing costs upfront, along with the down payment, it isn't always required. Many lenders will allow you to roll at least a portion of the closing costs into the loan amount, just as long as you are able to still qualify for the increased amount of the loan.